We decided to move last night to Tonsai for a change of scenery. Monica said that she was moving over here as well. We wanted to get over here before the International Climbing Comp. which starts on the 14th so we packed our bags and got a refund for the night. 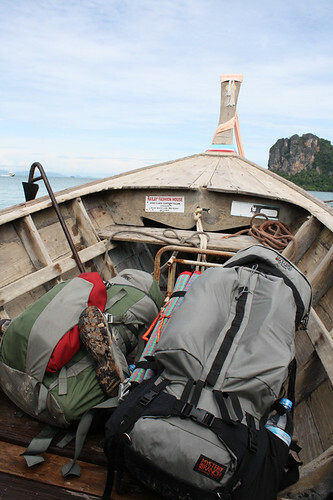 We made the short walk to Railay West to catch a long-tail to Tonsai. Waiting on this beach for the four person discount to Tonsai. We did not want to pay the 100 BHT for two people so we waited about a half hour and two others showed up. Making our trip 50 BHT for two less than 2 dollars. Everything for the month in a Big Sky and a G-5000. Once arriving we had no idea where to go and the locals just pointed us up the hill. So we blindly went and ran into the Dream Valley Resort where we got a bungalow for 500 BHT per night plus breakfast for both of us- a killer deal. Loni passes some longtails on Tonsai Beach. The views on the west side of the peninsula are far superior to the east. Long-tails racing from Ao Nang outside the bay and Koh Po Da , Chicken and Happy Island all lined up like gems towering from the Adaman Sea. After lunch we went to go check out The Nest climbing area- which is like 200 yds. from our bungalow. Wow it is a scorcher today sweat just oozing off our bodies. We warmed up on a glassy 6a. Loni had a hard time with it the climb it was a real piece of “kea” any way. 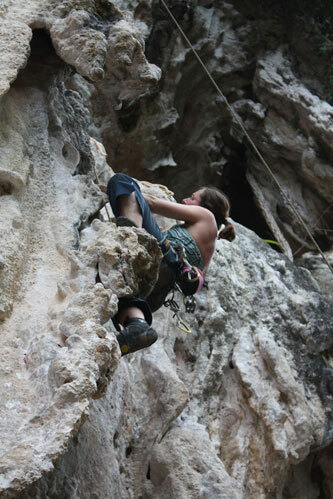 Next I got on a 7a+ called Jungle Love a couple climbs down that was superb. Steep sloping rails that led to a mantle then onto a column to an airy finish on a stalactite at 30 meters. Wild! I then led Banana Hammock 6a+ a five star route for sure up a massive tufa formation. You literally hump your way up it for a bit, straddling the tufa- very fun and steep for the grade.